For many students, drawing the figure and proportion are their first stumbling block. You don’t have to be an illustrator but you DO need to understand the body and how clothes hang on it. Here you will learn to draw a fashion figure, how to use a pose you see in a magazine and convert it to a fashion figure. 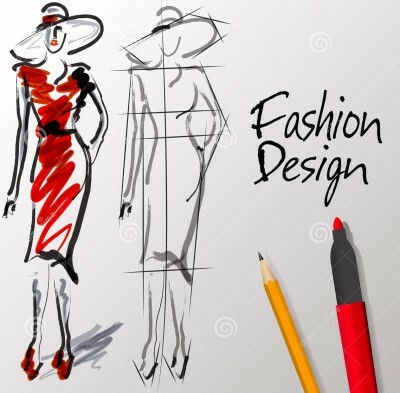 Learn the use of CROQUIS, learn SILHOUETTES, How to draw clothes on the figure, fold, pleats, ruffles, collars, fur, sequins, plaids and other textures . You will also learn basic color theory and color relationships. What is the real job of fashion design? what skills are needed ? Learn this as well as seasons, sizing and markets. This class will cover basics of natural fabrics/fabrications as well as a capsulized history of fashion in 10 & 20th Centuries. You will explore trending and use all of this information to meet several design challenges assigned throughout the course. From these exercises, you will begin to develop a small line.